Exence has finally revealed the tracklist for their forthcoming new album “Tabula Rasa”. The album was mixed at the 16th Cellars Studios by Stefano Marbito. “Tabula Rasa” will be released to the stores coming May 2013 by Punihsment 18 Records. Chilean Deathmetallers DEATH VOMIT have inked a deal with Xtreem Music for the release of their debut album which is actually being recorded for a summer release both on CD & vinyl format. 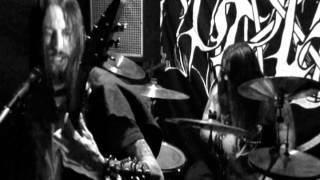 DEATH VOMIT was born in 2011 in the city of Curico (Chile) by Azazzel (guitar/ vocals) and Evil Escorzized (drums) influenced by ancient beasts with a grotesque, putrid and devastating sound in the vein of classic bands like Megaslaughter, Purtenance, Cancer, Merciless, Carbonized... recording their debut demo "Infestation" in 2012, released only on cassette format. Later on, bass player Tom "evil" Hill, who already played on the demo, joined the band as permanent member, followed by Sebastián Salce (guitar) as well, completing the line up and starting to create new tunes of the most violent and perverse Death/ Thrash for their debut album. At the moment the band don't have any official website since they consider it doesn't fit on the band's philosophy and so far the only way to contact them is through Xtreem Music. You can listen to the entire "Infestation" demo 2012 below. My Kingdom Music announced that the Norwegian Apocalyptic Black Metal force REVELATION'S HAMMER have been signed for the release of their self-titled debut album. With their unique and impressive sound of dark, epic and powerful black metal, the album is expected to be considered as one of the "the next big things" within the Scandinavian Black Metal movement. With a modern, but yet old-school piece of art, REVELATION'S HAMMER is ready to claim their throne within the extreme music scene and will definitely hook you up with their intense way of performing the black arts. Epic song structures, devastating and hateful vocals, ultrafast tremolo riffing, hellish drums of another dimension and a apocalyptic atmosphere that really brings forward a true sense of doom. The throat and strings is managed by the bands' mastermind ACCUSER while their heavy battery is performed by MYRVOLL from Norwegian NIDINGR. The album is mixed by Børge Finstad at infamous Toproom Studio (MAYHEM, BORKNAGAR) and mastered by legendary Peter In de Betou (WATAIN, DIMMU BORGIR, DARK FUNERAL). EXILIS from TROLL appears as a guest musician on some of the tracks. The artwork is put together by Portuguese Ricardo Fernandes and is a truly amazing collage built upon a carefully chosen collection of (anti)religious paintings that reflects the band's conception. REVELATION'S HAMMER debut album is scheduled for release on June 3rd, 2013 through My Kingdom Music. Grindcore masters Pig Destroyer have released a never before heard EP entitled ‘Mass &Volume’. This EP is dedicated to the memory of Pat Egan and to the loving family that he left behind. Artwork was created by Arik Roper. The EP is available for purchase at Bandcamp. This is the only format that this EP is available in and all proceeds of this recording will be donated to the college fund of Pat Egan‘s daughter, Katie. This EP was written and recorded during the final day of the ‘Phantom Limb’ sessions with unexpected extra studio time and resources. Fallujah are debuting a track titled ‘The Dead Sea’ from their upcoming release ‘Nomadic’ which will be out on April 2, give the new tune a whirl right now below. New York death metal legends, Immolation have unveiled the artwork and track listing for their upcoming ninth full-length album ‘Kingdom of Conspiracy’. The cover imagery was brought to life by Pär Olofsson (Immortal, The Faceless, Abysmal Dawn). The follow up to their 2010 release ‘Majesty and Decay’, will be released on May 14th in North America both digitally and physically via Nuclear Blast. The album was recorded at Sound Studios in Millbrook, NY with longtime producer Paul Orofino, and mixed-mastered by Zack Ohren (All Shall Perish, Decrepit Birth, Suffocation). Entrails, who signed to Metal Blade records last year and recently wrapped up work with Dan Swano, have launched the first single and released the art for their third album ‘Raging Death’. As They Burn have released a music video for ‘Dream Collapse’, from their new album ‘Will, Love, Life’. An introduction to their blend of groove-oriented technical-death metal, ‘Dream Collapse’ is an ode to crashing dreams and forgotten plans for the future. Abiotic have got together with director Dan Drescher, who filmed their previous video ‘Vermosapien’, to shoot a brand new video for ‘Facades’. The video’s release date will be announced later, but Abiotic has posted several images on their Facebook page. "Terror Regime", the title track of the eighth studio album from Wisconsin death metallers JUNGLE ROT, can be streamed below. "Terror Regime" will be released on March 19 via Victory Records. 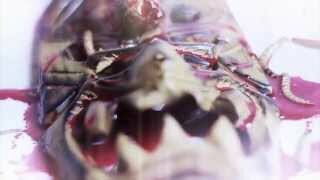 "Alchemy Of Blood", the new video from Polish extreme metallers HATE, can be seen below. The track comes off the band's new album, "Solarflesh", which was released in North America on February 5 via Napalm Records. Prosthetic Records will release "Gates To The Pantheon", the new album by German black/death quintet NEGATOR, in North America this spring. The CD will be made available physically on May 14 and digitally on April 23 to coincide with its European release through Viva Hate Records. The band is currently offering a free download of the single "Atonement In Blood" using the SoundCloud widget below.